Gaunt says that the numerological code tells of a Grand Octave of Time for man. She demonstrates that the Bibles number code reveals amazing realities for today's world, and gives evidence of the year of the second coming of Jesus Christ. The book reveals amazing evidence that the code number for Jesus Christ has been planted in the geometry of the Earth, ancient megalithic buildings in Egypt, Britain and elsewhere, and in the Bible itself. Gaunt examines the mathematics of the Great Pyramid, Stonehenge, and the city of Bethlehem, which she says bears the number of Jesus in its latitude and longitude. 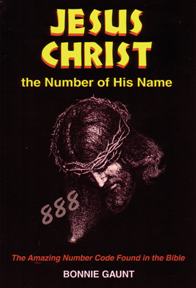 Discover the hidden meaning to such number codes in the Bible as 666, 888, 864, 3168, and more.